What Is Chert? How Does It Form? What Is It Used For? Chert: This specimen of gray chert is about two inches (five centimeters) across. It breaks with a smooth conchoidal fracture. Edges of the piece have sharp edges as a result of the conchoidal fracture. Chert is a sedimentary rock composed of microcrystalline or cryptocrystalline quartz, the mineral form of silicon dioxide (SiO2). It occurs as nodules, concretionary masses, and as layered deposits. Chert breaks with a conchoidal fracture, often producing very sharp edges. Early people took advantage of how chert breaks and used it to fashion cutting tools and weapons. "Chert" and "flint" are names used for the same material. Both are varieties of chalcedony. Is this Rock Flint? Chert? or Jasper? Chert can form when microcrystals of silicon dioxide grow within soft sediments that will become limestone or chalk. In these sediments, enormous numbers of silicon dioxide microcrystals grow into irregularly-shaped nodules or concretions when dissolved silica is transported to the formation site by the movement of groundwater. If the nodules or concretions are numerous, they can grow large enough to merge with one another to form a nearly continuous layer of chert within the sediment mass. Chert formed in this manner is a chemical sedimentary rock. Some of the silicon dioxide in chert is thought to have a biological origin. In some parts of the ocean and in shallow seas, large numbers of diatoms and radiolarians live in the water. These organisms have a glassy silica skeleton. Some sponges also produce "spicules" that are composed of silica. When these organisms die, their silica skeletons fall to the bottom, dissolve, recrystallize, and might become part of a chert nodule. In some areas the sedimentation rate of these materials is high enough to produce rock layers that are thick and laterally extensive. Chert formed in this way could be considered a biological sedimentary rock. 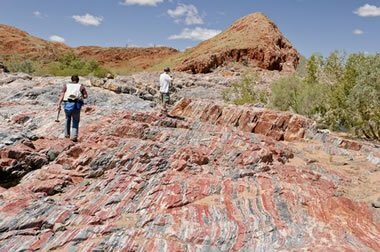 Marble Bar Chert: Outcrop of the 3.4 Ga Marble Bar Chert, Pilbara Craton, Australia. The hematite-rich chert has been used as evidence of high levels of atmospheric oxygen in the early Archean. Image by NASA Astrobiological Institute. Chert is a microcrystalline silicon dioxide (SiO2). As chert nodules or concretions grow within a sediment mass, their growth can incorporate significant amounts of the surrounding sediment as inclusions. These inclusions can impart a distinctive color to the chert. 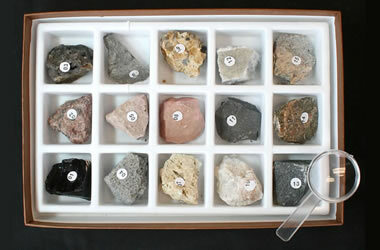 Chert occurs in a wide variety of colors. Continuous color gradients exist between white and black or between cream and brown. Green, yellow, orange, and red cherts are also common. The darker colors often result from inclusions of mineral matter and organic matter. Abundant iron oxides in the chert can produce a red color. The name "jasper" is frequently used for these reddish cherts. Abundant organic material can produce gray or black chert. The name "flint" is often used in reference to the darker colors of chert. Chert Arrowhead: A chert (flint) arrowhead bound to a wooden arrow shaft with sinew. Image copyright iStockphoto / Brian Brockman. 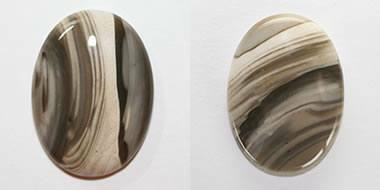 Chert cabochons: Occasionally, specimens of chert with attractive colors or interesting patterns are cut as gemstones. These chert cabochons are examples. Chert has very few uses today; however, it was a very important tool-making material in the past. Chert has two properties that made it especially useful: 1) it breaks with a conchoidal fracture to form very sharp edges, and, 2) it is very hard (7 on the Mohs Scale). 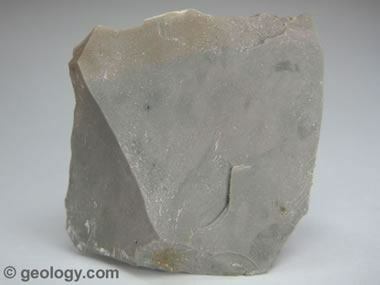 The edges of broken chert are sharp and tend to retain their sharpness because chert is a very hard and very durable rock. Thousands of years ago people discovered these properties of chert and learned how to intentionally break it to produce cutting tools such as knife blades, arrowheads, scrapers, and ax heads. Tons of chert fragments have been found at locations where these objects were produced in what was one of the earliest manufacturing activities of people. Chert is not found everywhere. It was a precious commodity that early people traded and transported long distances. As early as 8000 BC, the people of what are now England and France dug shafts up to 300 feet deep into layers of soft chalk to mine chert nodules. These are some of the oldest underground mining operations ever discovered. 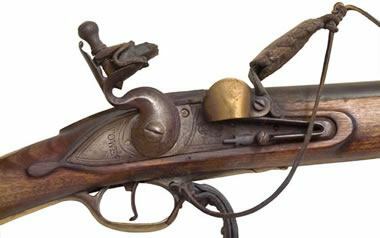 Flintlock: A close-up of the lock of a flintlock rifle, a weapon of the 18th century used in the Revolutionary War. Note the piece of chert (flint) in the hammer. Image copyright iStockphoto / Kakupacal. Chert is a very hard material that produces a spark when it is struck against steel. The heat from this spark can be used to start fires. A "flintlock" is an early firearm in which a charge of gunpowder is ignited by a flint hammer striking a metal plate (see photo). A variety of metamorphosed chert known as "novaculite" has a porous, even texture that makes it useful as a sharpening stone. The Arkansas Novaculite Formation has become world famous as a source of high-quality sharpening stones and novaculite abrasive products.